Using the latest CCTV technology to detect intruders & provide real time images from the vehicle. As you will have no doubt heard in the news of late, UK law states that it is the drivers’ responsibility to ensure that their vehicles’ seals have not been broken into and that migrants haven’t entered their vehicles illegally. Whilst we are not unsympathetic to the plight of migrants fleeing war-torn countries, we have been very aware that we have the technology to help freight drivers ensure that they stay within the law. Awareness though, is not enough, it is action that changes lives and we have taken action to engineer a state of art intrusion detection solution that takes away any doubt for drivers and their employers by providing a fail-proof, always on, real time, monitored intrusion detection solution, called fr8Watch. Detecting intruders using low light capable cameras and video analytics has become relatively commonplace in the world of buildings offices factories and the like. However icomply have recently developed a new software solution which gives remote access over low bandwidth to CCTV being stored or streamed from remote – in this case mobile – devices. 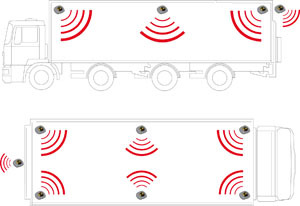 Recognising that there is no one size fits all solution for this sector (cabs and trailers come in all shapes and sizes after all), we have developed an affordable, customisable solution combining latest generation low light, infra red or thermal camera, and video analytics to detect and report vehicle intrusion as it happens. It works by fitting low light capable, hi definition CCTV cameras discretely within trailers to monitor vehicles’ interiors and perimeters. This footage disappears into an icomply designed “black box” mounted discreetly according to the type and purpose of vehicle. This unit – the FSU (freight safety unit) is built in a ruggedised chassis complete with lockable hot swap hard disk. When the video “tripwire” is crossed, the FSU transmits an alarm. It can signal to an alarm receiving centre – or it can simply text to a list of people it has been pre programmed to text to. CCTV records on board in full evidential quality. Meanwhile the FSU has figured out what bandwidth it has available, and begins to stream video to (optionally) the alarm receiving centre – and the icomplycloud web portal, where (if you have the correct credentials) you can log in and see what triggered the alarm, and the live images. Authorised users (drivers and freight companies’ security services, for example) can access the web portal by phone, tablet, laptop or desktop – no special software required, its all done through your favourite browser. fr8Watch is designed with battery back up in mind. Power consumption requirements are factored into each system design. fr8Watch is discrete and has no moving parts – all solid state technology. To find out more please contact Hugh Barker or call 0113 231 1100.